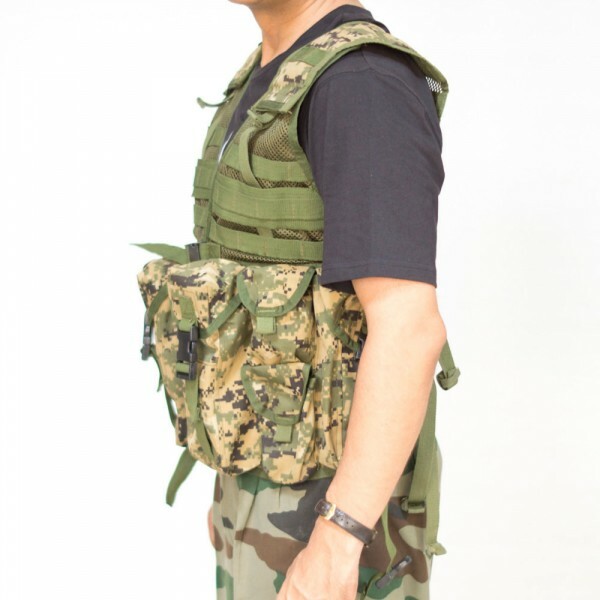 This ‘jacket’ shaped, durable magazine pouches set, with 8 external pouches, is specially designed for combat operations – for easy wear, easy access to ammunition and secure carriage. The jacket forms a very convenient ‘over-wear’ for carrying a huge variety of items. It can be used by hobbyists and enthusiasts and as a DIY (‘Do It yourself) accessory. The gear is deliberately kept as light as possible, to keep the overall weight low. It is made to military grade specifications, for prolonged rough use in field. Magazine Pouches: The jacket has four magazine pouches, two on either side. The magazine pouches have Velcro flaps for fast opening and closing. For situations requiring stealth, where the sound of Velcro is not acceptable, the Velcro flaps can be covered with Velcro strips attached to the pouches. Pouches can then be secured / opened using the cam style buckles provided. 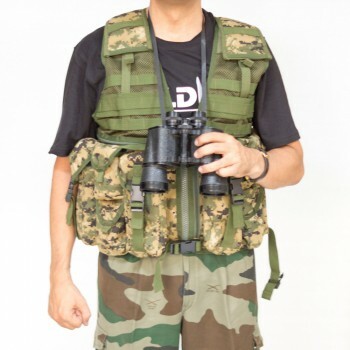 Grenade Pouches: The jacket has four small pouches, two on either side, for carrying grenades, loose ammunition or similar items. The pouches are secured with heavy snap buttons. 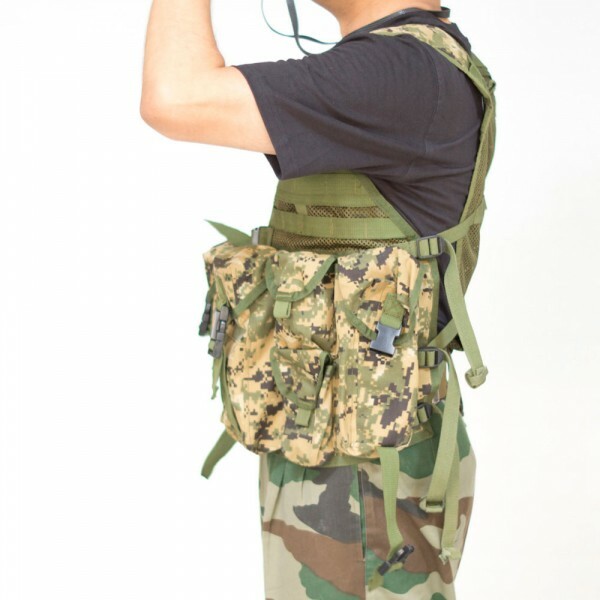 Large External Zipped Pockets: In addition to the pouches, there are two zipped pockets, one on either side, under the pouches, which can be used to hold other battle accessories or personal belongings. 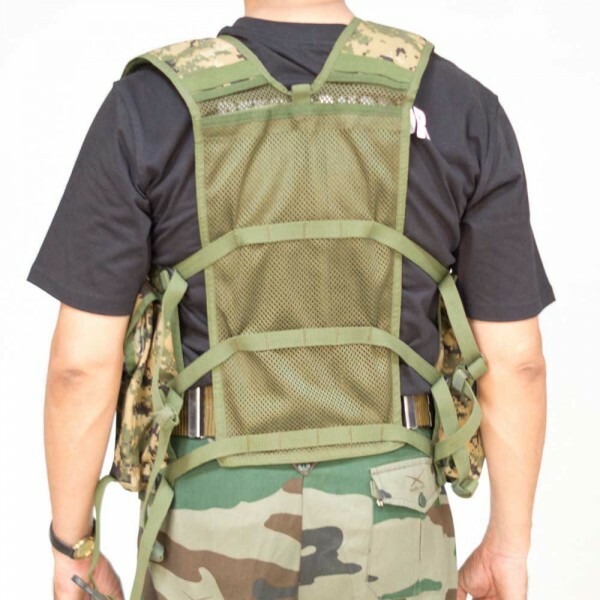 Adjustable Cam Style Buckles at Waist: The ammunition jacket is secured around the waist using two cam style buckles, for providing an adjustable fit. The buckles can be loosened as per requirement. Jacket Front Zip: In addition to the cam style buckles, there is a zip provided to provide a closer fit than the cam style buckles, if required. Adjustable Padded Shoulders: The shoulders of the jacket are adjustable using buckles. Pads are provided over the buckles, to provide better comfort. Uses: This is a combat magazine / ammunition pouch set, for soldiers, para-military forces and police, engaged in combat operations, where they expect enemy or insurgent small arms fire or shrapnel due to artillery, grenades or other explosive devices. The jacket forms a very convenient ‘over-wear’ for carrying a huge variety of items. It can be used by hobbyists and enthusiasts and as a DIY (‘Do It yourself) accessory.